I am guessing you have been hearing from A LOT of people all year long. I'm also guessing that most, if not all of it, has been complaints, accusations, and even some threats. I'll admit that there have been times when I've thought you were overdoing it. And I don't want to be a Pollyanna (which trust me, no one has EVER accused me of being), but I also want you to know that there's at least one person who knows that just like any other year, you were not all bad. Everyone seems to want you gone. Which is understandable, because even in the best of times, people like to think and hope the future will be better. And it doesn't improve anything to live in the past. But at the same time, I always wish that people would not wish time away. Because time never ever comes back. Even on my darkest days, I'm aware of that. Maybe your time here has to be threatened for you to appreciate it (for my part, I think I've learned this many times over, so you could actually give it a rest, at least for a while); I don't know. I just know that life is way too short, whether you live to be 2 years old or 102 years old, and though it can be difficult, if you can remember to try to at least acknowledge and maybe even appreciate, the here and now, you'll be better off in the long run. I think it avoids the coulda/shoulda/wish-I'd-done-feeling when it comes to the end. Anyway, I would like to point out the good things from this year, so that both of us can know they actually happened. 1. I celebrated my 60th birthday! I love birthdays and love being here to celebrate them. When I turned 60, I was well aware of the fact that I had been here on earth for seven years longer than my father had. 2. For the first six months of the year, our Dug the Doodle Dog was with us - and for at least the first four months, he was his usual, happy self. I will ALWAYS be grateful for this. He meant so much to every single one of us, and even during the last couple of months, when he wasn't feeling 100%, he was such a wonderful boy. We are glad that he didn't suffer, and that he is no longer sick at all. We would love to still have him here, but not if he had to be sick. Thank you for every minute of 2016 we had to spend with him. 3. We had some great weekends in Rehoboth Beach with family. This was not just a treat, but some of the best times we had the entire year. To be there, having such fun, and laughing so much, should be something that would make any year a good one, no matter what else happened. 4. Our September trip to New England was not only amazing, but helped us feel some genuine happiness at the chance to go new places, and see new things. Every part of it was perfect - it was nice that even when it rained, it was only overnight! 6. The Tim turned 60, and we had a fabulous weekend with family in Baltimore to celebrate. Both of us are still here, with no plans to go anywhere else. We had a blast in Baltimore, and the surprise party for The Tim was definitely a highlight of this year. I have to tell you, 2016, I wasn't really worried that The Tim wouldn't be here for the Big 6-0, but I am eternally grateful that he was and is. I would be lost without him. 7. The success of my Harry's Hundred Project! I wasn't sure how/if it would work at all - especially since I was so busy with Christmas gifts most of the year, that I only managed to knit a few things for my part in it. But by the end of November, we'd surpassed the goal, and I know there are some additions for December as well. 8. The Holidays. OK, we are - at least in our house - still celebrating the end-of-year holidays, but we've had a good holiday season this year, and made sure to enjoy everything we could about it. 9. Our extended families are well and happy. Invaluable. 10. Our immediate family is well and happy. Though as I write this post, I'm dealing with a particularly obnoxious cold, we are - all of us - doing just fine. I am hoping that will continue, and one of my goals for 2017 is to get the cats back on track with their regular vet visits (we got distracted this past year, as I'm sure you understand). I plan to do my best to improve my health, and I'm guessing The Tim wants to get back on track too. So there are ten things, 2016, that happened this year that are good things, happy things, and wonderful memories. I want you to know that they mattered to me, and that I have every plan of enjoying the last couple of days you are with us. I hope that 2017 will also give me a lot to celebrate (in spite of the ascendancy of The Orange One), but I'll only be able to know that by living it. Thanks for every minute of the good. If you have any influence at all, please put in a good word for us to 2017. 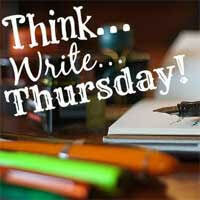 For this week's Think Write Thursday, Carole and Kat asked us to write about New Year's Eve - like or not? Celebrate or not? Musings? I'm one of those people who enjoys New Year's Eve. The only time I haven't enjoyed it was the year in high school when I babysat for a couple on New Year's Eve. First of all, I wasn't really into babysitting. Secondly, they didn't get home until 3:00 a.m. and then they were still drunk. Fortunately, I lived two blocks away so I didn't have to be driven home. I've never been one for big parties, though I would have liked going to New Year's Eve in Times Square before that got ruined by TV "events." Growing up, my parents were either home and had people over to play cards, or they went to friends' homes to do the same. I used to like staying up and watching the ball drop, and thinking "Wow, it's another year." I have to admit that the idea still kinda amazes me. 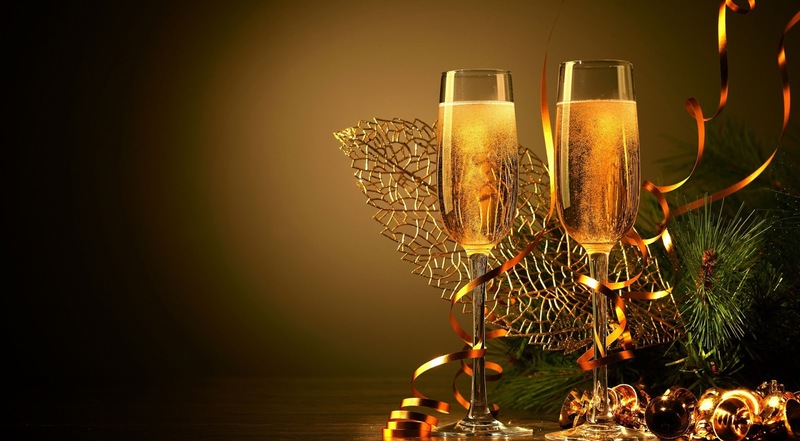 But our New Year's Eve is lovely, if what others might think of as boring. The Tim usually has to work, but fortunately the bookstore closes about 6 p.m. So we usually go out to dinner somewhere in the neighborhood, and then come home for the rest of the evening. Around 10:30, we get the treats ready - always a Christmas cheeseball, often some steamed shrimp, and whatever else appeals at the time - and the champagne. At about 11:55, we toast away the old year. 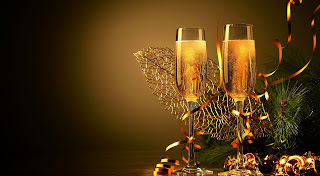 Then we watch the ball drop, have our little family "Happy New Year" exclamations and kisses, and have more champagne. And we are generally in bed no later than 12:30 a.m.
New Year's Eve does make me nostalgic, though. I miss family members, places, and things. I feel sad that another year has passed and will never be again. But in the end, if I am able to celebrate New Year's Eve and New Year's, it means I've made it. And though every year has it's goods, bad, and uglies, I'd still rather be here than not. 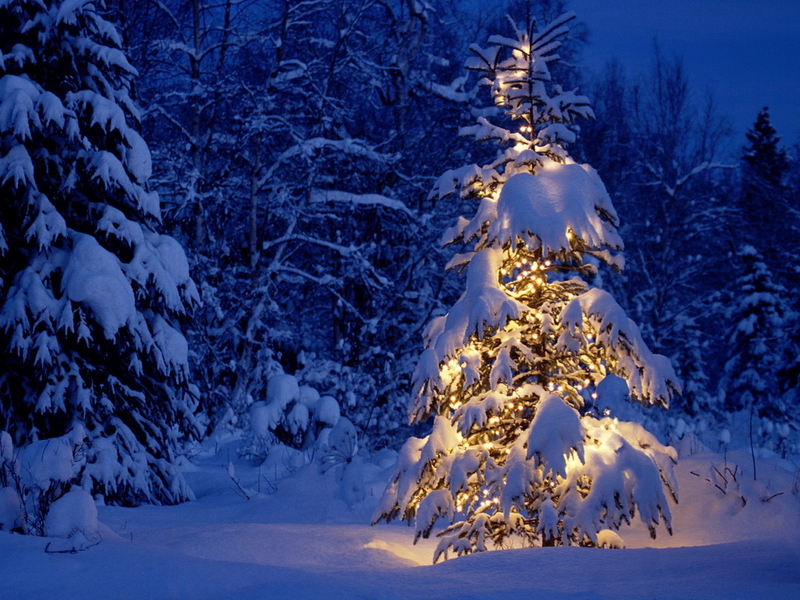 Hello all - I hope you had a wonderful Christmas Day, and continue to enjoy Christmastime. Ours was great, and you will be forced to hear/see more about it, but for now I wanted to play along with Kathy's end of the year Questions and Answers - on the actual day they are posted! Name your best FO of 2016. 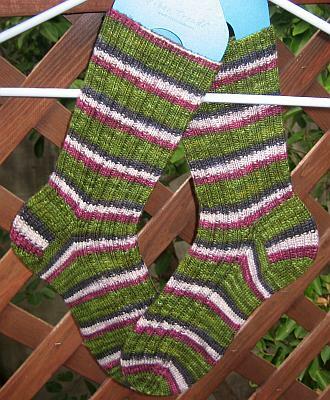 I would have to say the Vacation Socks I knit for The Tim during our New England vacation in September. 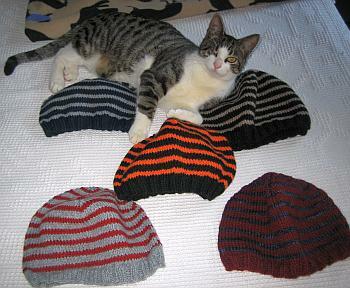 I knit them at what for me was record time, and though he saw them as I worked on them, he had no idea they were for him. I love the way they turned out, and seeing them reminds me of a wonderful part of what was a difficult year. 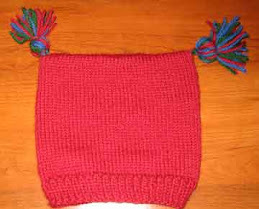 Ask someone in your family to name something you've knit for them. Did you get any yarn gifts this holiday? No, I didn't. But Santa did bring me a copy of Knitting from the North, which I am really excited to have! More than a few of the patterns are things I'd like to try. 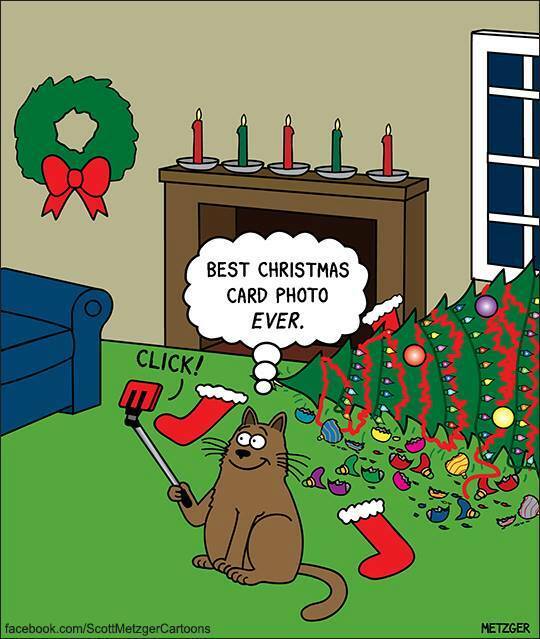 Did your pets get any gifts? What is a great tip or idea you got this year? How did you surprise yourself in 2016? I surprised myself at how well I managed to hold it together this year. It was one of the most challenging years I can remember, and though precarious, I did better than I thought I would or could. I hope at the end of next year I can say the same. Name a favorite book you read in 2016. My favorite book this year was A Man Called Ove, by Fredrik Backman. As a matter of fact, it's one of the few books I have added to my list of favorite books ever. I can actually see myself reading it again sometime. What is the latest you stayed up in 2016? Well, I'm guessing this means stayed up for a reason other than not being able to sleep, so that's how I'm gonna answer. The first Saturday evening in December, we had a small dinner party, and it was a lot of fun, but by the time everyone left, I cleaned up, and had a chance to settle myself, it was ~ 2:30 p.m. I'm 99% sure I never stayed up that late on purpose even when I was younger! Name a play, show, or concert you went to in 2016. Name a new drink, dessert, or dish you found in 2016. My favorite new dish that comes to mind is the recipe for Creamy Avocado Alfredo Pasta (shared here). It's relatively simple, and just so yummy! What about you? How did your 2016 do, according to these questions? Feel free to share in the comments, or write your own post - I enjoy reading everyone else's as much as I enjoy writing my own. Thanks to Kathy for a fun year of these Q & A posts - I for one hope they continue! The wait is nearly over. We once again have the chance to start anew. I hope your holiday, whatever one you celebrate, will bring you happiness, merriment, laughter, hope, love, and peace. Whether you are in the circle of your family and/or friends, or learning a new way to celebrate, I hope it's one of the best holidays ever. Know that you are loved, even if that is sometimes hard to remember. May the light of the season bring you joy. Today I'm taking another turn contributing a post to sprite's Virtual Advent Tour. Before saying anything else, I have to tell you that it has been so great to read everyone's posts this year. I hope she will consider hosting again next year. Part of what makes the whole thing so interesting is finding out how people "do" holidays. To some degree, it's all variations on a central theme, but I don't think anyone celebrates holidays *exactly* like anyone else. Years ago, I remember reading an article in the newspaper written by a family therapist, and she said that most of the couples who come to her had issues with two topics: Money and holiday traditions. I read that part out loud to The Tim, and then said, "Fortunately, we agree on money issues, and we've never argued about how to celebrate holidays." And he responded, "That's because we've always done it your way." The short version of the discussion that followed was that first and foremost, he was giving me a hard time, and secondly, there were very few traditions that seemed overly important to his family, so he was more than happy to adjust to how I wanted to do things. Having said that, we have adjusted some of our traditions as well as created new ones over the years. Originally, we both used to have jobs where we could either take the week between Christmas and New Year's off, or could take the time off without any problem. So we would travel to be with our families. It was always fun, and there are so many happy memories from those times. Once The Tim started working in retail, not only did we no longer travel at Christmastime, but we had to adjust to the fact that he couldn't take any time off, and was also required to work six days a week during December instead of only five. Trust me, that took some adjustment! But now it's the usual, and though I would love to be able to see more people and do more things at holiday time, we still have the best time ever. Traditions are open to interpretation, is what I'm saying. So if there are any of you struggling because you can't do things this year the way you have always done them before, remember that the holidays are supposed to be fun. And no one can have fun if all they can think about is what they are missing. All of our packages have been sent, and we already know that one has arrived safely. :-) I am hoping news of the others will be the same. Frankly, once that is done, The Tim and I have a nice long stretch all to ourselves to relax and enjoy the wait for Christmas Day. This past weekend we finished decorating the tree and putting out all of the decorations. Then yesterday I [finally] cleaned the house so a) it would look nice for the rest of the season, and b) Santa would not be appalled. It makes such a difference! The house gets to be sooo gross with the two of us and our furry companions. But at least right now, it's looking good. Then this afternoon I had my eye exam. Usually it doesn't take all that long, but the person who I had the appt with had called out sick, so they had one optometrist for all of the appts. My future cataracts have not advanced much, but my Rx had changed pretty significantly, so I have to get new glasses. I can live with that. The funny thing is, this is the first time for a few years my eyes had not been bothering me prior to going. Those years, the other Rxs had been affected (computer and reading); this year, it was my distance vision that had apparently changed a lot! I guess I figured the distance was just naturally a little blurry? This is a nice short week for me, with today off and Friday taken as my last personal day for the year (I didn't want to lose it by not taking it before the end of the year!). That is just fine with me. 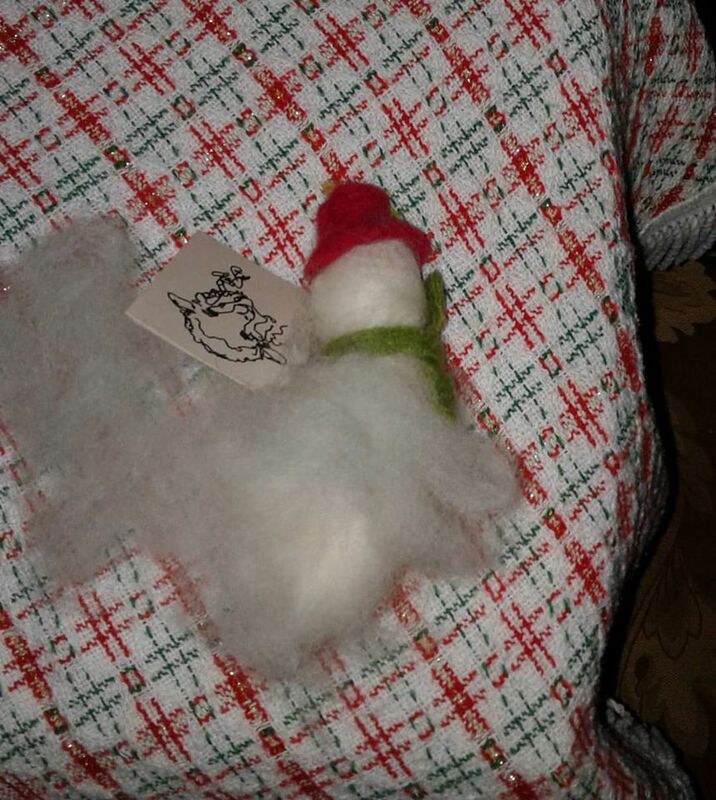 RIP, snowman ornament. We hardly knew ye. One of my favorite Christmas CDs is this one. And though I have never ever thought of it as a Christmastime song, the last one on the CD it is Lullabye (Goodnight My Angel), by Billy Joel. Their performance of it is so beautiful, and evocative of Christmas feeling in the way it is arranged, that it has become one of my favorite versions of an already favorite song. 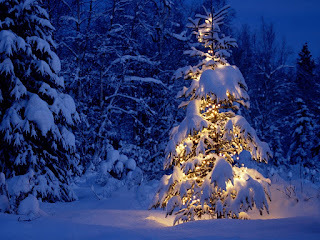 So on this Friday, when there are 9 days left before Christmas Day, I hope you will enjoy it as well. Have a wonderful holiday season weekend. This week brings us another bunch of good questions from Kathy, so I'm going to play along. BUT - before we get to that, I wanted to share a couple of links. And then, for your Christmastime pleasure, here are a few cute ornaments to knit, courtesy of Kate, and they are freebies, so it's a win-win! 1. 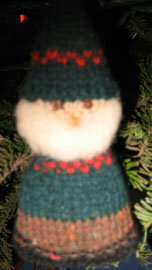 Have you ever knit a Christmas ornament? Yes. I made this a few years back, and want to make more! And, a few years ago, I knit an Advent Calendar garland, which is a Christmas decoration, if not technically an ornament. 2. 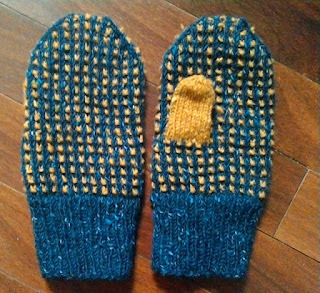 Have you ever knit with sparkle yarn? 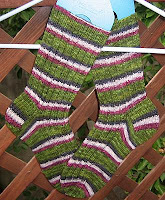 Not so far, though I have two skeins of sock yarn with stellina in them, so somewhat sparkly knitting is in my future. 3. Did you buy yarn while travelling this year? Yes! I bought a skein in Mystic Seaport, CT during our New England vacation, and a skein in two different places on two different trips to Baltimore. 4. 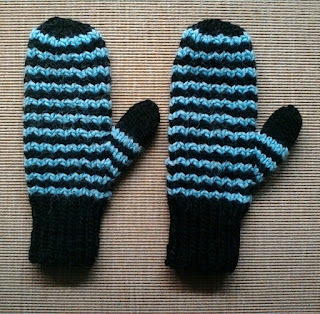 When's the last time you wore something you knit? Today. I wore my Silk Kerchief, which is one of my fave accessories when it's cold. Sometimes. Usually when they are extremely weird or disturbing. 6. What's the one thing you don't want to run out of? Spiritually, Christmas cheer. Practically, tea. 7. Deep dish or thin pizza? Thin-ish. Not real paper thin. The Tim makes a perfect crust. If you are in Chicago though, real deep-dish pizza is mighty tasty. 8. 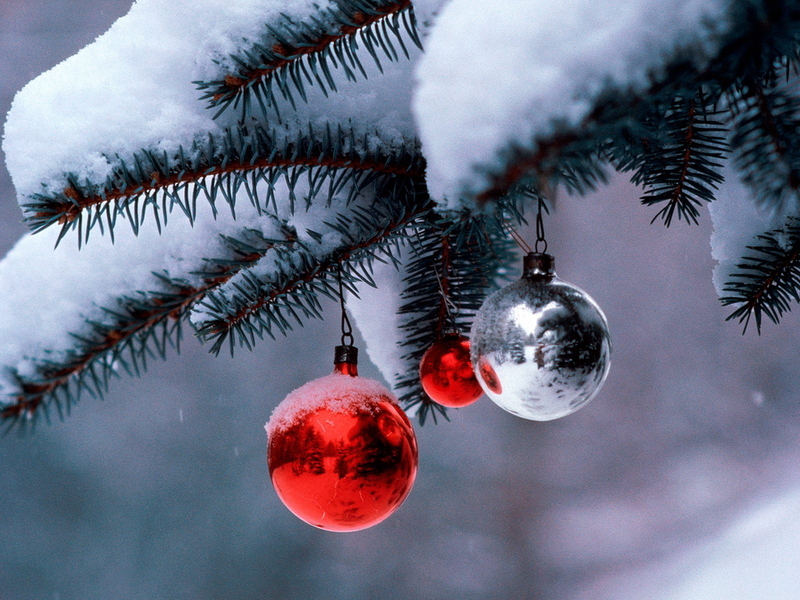 Name a favorite holiday Christmas CD, or album for us oldies. and, Christmas with the Cambridge Singers. 9. How do you remind yourself a candle has been lit? Whenever I have a candle lit, I'm right there. If I leave the room, I automatically blow it out and make sure it's out. Having lived through two house fires, I'm very conscious of it. 10. What's the ring tone on your phone? OK, that's it for today - have a good one! This past weekend was a 50/50 one. Saturday was kinda lousy, Sunday was much better. Basically Saturday morning The Tim and I had a huge misunderstanding about plans, and it just irritated me so much I wanted to spit. I did get over it eventually, and I did some laundry and baked a few cookies to keep my mind on something else, but it ended up being a frustrating, wasted day. I hate when that happens, but I especially hate it at Christmastime, when I have things I really want to do, and instead I let my mood distract me. In the end, yes it was nice to have baked some cookies, and have finished some laundry, but frankly those were not high on my list of what I wanted to accomplish on Saturday. Such is life, First world problems and all of that. 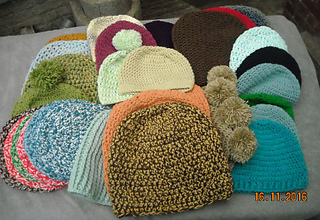 One of the things I thought would be a great idea on Saturday afternoon, since it was sunny, was to take photos of the Turn A Square Hats and Portfolio Scarves I'd knit for Christmas gifts before I wrapped them up and sent them to their respective recipients. The Tim and the cats were all dozing, so it seemed like a good time to work without interruption. And that should have been my first clue that I was being delusional. 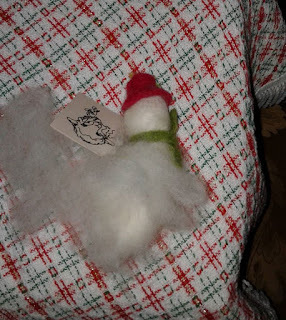 Because although Jetsam and Milo the Koodle pretty much stayed asleep the whole time, and just showed up at the end to sniff, Pip and Jack decided that I couldn't be trusted to accomplish this task on my own. At first, they were each sitting in a window in the guest bedroom where I was going to take the photos. The light is decent in there when the sun is out, and the bed has a white bedspread, which would work well for contrast. I got everything set up for the first idea I had for photographing things, and the second I grabbed the camera, both cats jumped onto the bed! Because of course why wouldn't they? I tried various distractions to try and get them to leave the room, but really when you are the world's most annoying helpers, why would you leave? 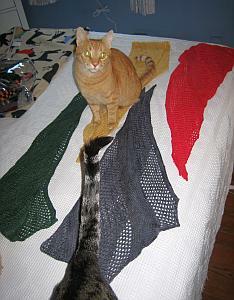 Every time I would try to pick one or the other up to move them, they would get their claws stuck, and I didn't want to risk harming the knits. So for a couple of minutes, I let them enjoy their hilarity. Once that was done, they each went to another part of the bed and started to get ready to nap or to take a bath. Well, until I started taking pictures, that is. After a while, I just gave up and tried to do the best I could. Granted, I'm not Richard Avedon. But I did just want some nice photos ... maybe even one that looked a teensy bit artistic. "These hats are striped like I am!" "These would be more comfortable if you could bunch them together." I tried a few more shots, and got some that might work after some editing. But clearly the next time, no matter how zonked out the feline members of the family may seem to be, I'm closing the door! Carole and Kat's Think Write Thursday, and Sprite's Virtual Advent Tour. And as it so happened, both asked us to write about our favorite holiday tradition. I have thought long and hard about this, and I cannot choose just one, or even decide if it's more favorite than another. Instead, I've decided to write about something *related* to a holiday tradition in my family. Our big Christmas meal was always on Christmas Eve. This was largely because my parents were incredibly social, so Christmas Day, after church, we'd be lucky if we ever got near a meal, between people stopping to visit us, and us visiting others. So about the time I was 8 years old, my parents decreed that our big family meal would be on Christmas Eve. Something to keep in mind is that it was seldom ever just our immediate family. There were always extra people, friends of my parents who might not have anywhere to be, friends of my sisters who weren't going home for Christmas, orphans from the orphanage where my great-aunt (one of the nuns previously written about) who had no where to go, and I don't know ... just others. Also, my parents tended to go all out at Christmas. We were relatively poor, but they would take money out of their savings, and use credit for Christmas - both for foods and for gifts. Aunt Viola was a good cook (or, as my father said, "Does it just seem that way because you never get enough to eat at their house? "), and the idea of homemade noodles was exciting to all of us, particularly since my mother never really made homemade anything. So we were all looking forward to trying them. Fast forward to Christmas Eve dinner. Everyone is there, and the table is COVERED with food of all kinds. There's talking, laughing, drinking, eating, and at some point during the meal, Aunt Viola asked my mother about the noodles. My mother responded in a surprised and contrite fashion, saying that with all the people and all the food, she forgot to fix them. Disappointing to be sure, but it's not like anyone was going to go away hungry. So we never did get the homemade noodles. But to this day, whenever we eat our Christmas meal, I think about those homemade noodles, which have become holiday legend in our family. We'll sit down to eat, and even The Tim will say, "Oh, I forgot to cook the homemade noodles!" The Tim and I have a tradition of a special Christmas Eve meal, and then a special Christmas Day meal. *Our last name was Arthur. However, Aunt Viola always referred to Uncle Bill as "Bill Arthurs." P.S. If you want to sign up for the Virtual Advent Tour, go here. It's fun and there are still some slots left! WE'VE GONE PAST 100 ITEMS!!! I am so incredibly excited about this, and humbled that so many people - particuarly ones I will never meet in person - have participated. People all over the U.S. and Europe! I had hoped that at least a few people that I am in touch with on a regular basis would contribute, and *hoped* we could get close to, or at least reach 100 by the end of the year. I am truly blown away by the thoughtfulness of people. So, let's take a look at the things from November that pushed up the numbers. Now I have to tell you, when I got the messages from these two people and realized they would put the Project over 100 items, I was so touched, I cried. Because people will be getting these and they will be able to feel warm, cozy, and hopefully at least a little bit loved. And for a lot of them, it may be the only thing making them feel that way. That is what it's all about in the end. Kindness and giving, without expecting personal thanks or recognition from the recipients. Giving because you want to, not because you feel you have to. Not worrying about who receives it, or if they'll wear it or use it the way *you* would want them to. Real gifts. 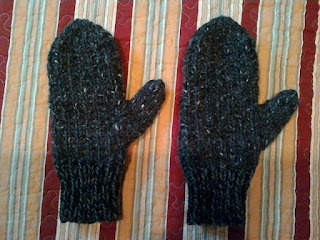 Now that my gift-knitting has been completed, I'm hoping to squeeze in a few more things myself, and I hope if you are so inclined, you'll do so too. Amazing. In the best way possible. *Can you knit something by heart? I can knit basic socks by heart, and now, I'm 99% sure I could knit both the Turn A Square Hat and Portfolio Scarf by heart! Though who knows in 6 months, they may be part of the mists in my mind. *Would you like some yarn for Christmas? Let's just say I wouldn't be upset. 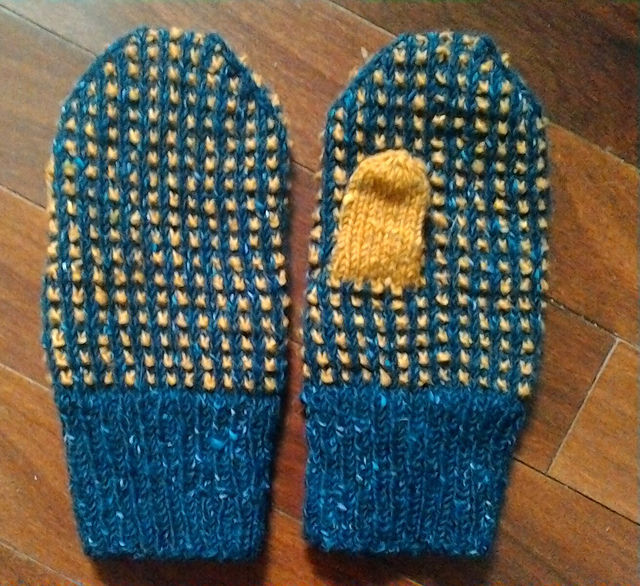 But it's not like I'm currently wishing for any particular yarn, and hoping against hope that someone gifts me with it. *Did you shovel any snow this December? No. We've had lots of rain instead of snow. *Can you make a bow for a package or a gift? *Do you buy used books or new? Hm. 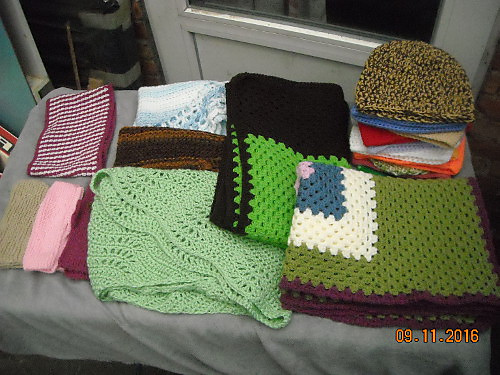 Frankly, I don't buy a lot of books at all, other than maybe the occasional knitting book. Then it's a mix of the two. Most of the time, I'll borrow books from the library. *Have you seen a living Nativity? No, and to be honest, I'd really only be interested in the animals anyway. *Have you ever received home-baked cookies in the mail? Just the other day, as a matter of fact! A co-worker from long ago, who was originally trained as a pastry chef, has sent us Christmas cookies ever since she moved out of town. We enjoy them, but I'm always a little bit surprised/flummoxxed, since though we were co-workers, we were never particularly close, and she is truly one of the strangest people I have ever met. Having said that, we love getting the package of cookies! *When was the last time your toes froze and your nose was red? I honestly can't remember the last time my toes froze. And my nose is always red in cold weather, regardless of temperature or how I'm dressed. *Did you know that Christmas and Hanukkah are intertwined this year? Yes, I did. I always check, since I am intrigued every year to find out the dates for Hanukkah. 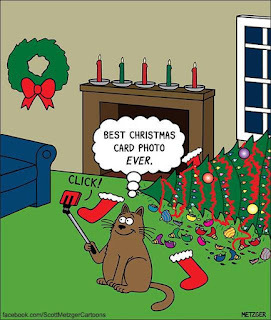 *Do you love to get a Christmas card? Yes I do! It's actually part of the reason I started my little holiday project, which has been extended through tomorrow, December 6. (So far we have a small but enthusiastic group.) I love to get mail in the first place, and Christmas and holiday cards make me feel even happier! Hello there - I hope you are all enjoying and/or surviving December. Thanks for all the nice comments about my post welcoming the month. However, as a result, I am behind on things, so I have decided to extend the deadline for anyone who wants to participate in the Great 2016 Holiday Snail Mail Card Exchange, to the end of the day on Tuesday, December 6. Then I'll send out the list to everyone on Wednesday, December 7. So far we have a few people, so I think it will be easily manageable for everyone involved, and anyone else who would like to join us. So please do, the more the merrier! This week our Christmas plans and preparations really go into gear. The Tim is planning to bring the boxes o' decorations up, and we'll go and pick out a tree. So exciting! I hope all of you have had a good weekend, and are not feeling crummy at all like I am! I'll be back soon with more ramblings. Have a good week! Well, we've arrived. Today is December, which means that 2016 only has a few weeks left. It's also Think Write Thursday, and today, Carole and Kat have given us the topic "Hello, December." Hello, December ~ I hope you know how glad I am to see you, but also how bittersweet you are to me. I love it when you show up, because Christmastime is one of my favorite times of all. Unlike most people I know, I don't find the season stressful or annoying. Rather, I look forward to the decorations, the music, the feeling of anticipation, and the fun of making or buying gifts for people. I love it when you are cold, because to me, December is supposed to be cold. I love that you are dark, because it makes the lights of the season and the idea of the Winter Solstice seem more special and beautiful. I wish you would be at least a little bit snowy, but that seems to be something only in my childhood memories most of the time now. I think you like showing up and making people pay attention. Even those who do not celebrate any holiday realize that it might be time to wrap up some plans, and/or start thinking ahead to what will be next. It's hard to travel through December and not notice something! Then again, I think of my mother's birthday on December 2, and how we would ease into Christmastime between Thanksgiving and then, and then afterwards, it was full speed ahead. I remember what fun it would be to make sure that she had a birthday, and not a Christmas/birthday combination. My father LOVED Christmastime, and is most likely the person who passed that love on to me. He'd be so busy with decorations, and cooking, and wrapping gifts. And he'd always ask us if we didn't think he sounded just like Frank Sinatra or Bing Crosby when he'd sing Christmas carols (the answer, in cas.e you are wondering, was always "no"). All the Christmases we would all be together, in one place all at once, having so much fun celebrating and catching up with each other, and all of the nieces and nephews having a chance to get to know each other and having such fun waiting for Santa. And most recently of all, my favorite recent tradition on Christmas Eve. Since The Tim always has to work, I'd put Dug's reindeer antlers and jingle bell collar on him, and we would take a Christmas Eve afternoon walk through Rittenhouse Square. People couldn't help but smile, and some people would want to take his picture, or have their picture taken with him. He loved the attention. And I always told him that if he made people smile, even just for a minute, he'd given them one of the best Christmas presents ever. It's gonna be really hard this year when that won't be able to happen. But you know what? It will be OK, because a good Christmas is about love. And even if it can't be the same as it always was, or recently was, your memories make it sweeter. You still have the love for those not here, and you can't lose that, any time of year. So December, thanks for showing up, especially this year, which has been a tough one. And I'm counting on you to make it worth going through the rest of it. I have The Tim, Jetsam, Pip, and Milo ... and this year, Jack, who has no idea what December or Christmas or Santa or even sadness is! Let's make the most of it, so that by the time 2017 pushes it's way in, we'll be able to say that you gave us a good ending, and we did the best with what we had. Thanks for showing up. I plan to enjoy you as much as I possibly can, 'cause I look forward to seeing you every year, And regardless of what else has been happening, I'm not willing to give up on that.